Half-Scottish and half-Italian, Jock Zonfrillo grew up with rich food memories and traditions. a�?I believe food has healing powers and this is the very core of my food philosophy and passion,a�? he says, ahead of the premiere of Nomad Chef which sees him setting off to remote places to discover food with nothing but a knife roll and a sense of adventure. 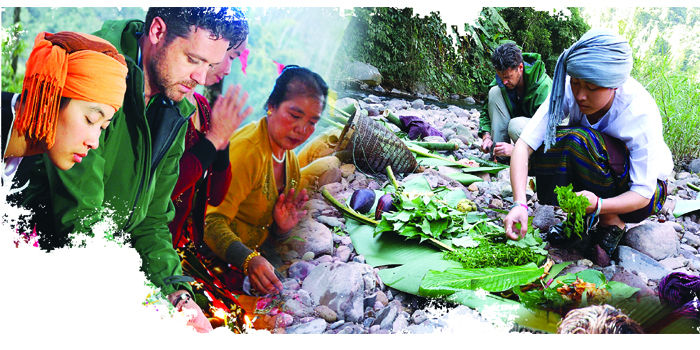 Zonfrillo connects with some of the most reclusive communities on the planet in places like Ethiopia, Japan, Australia, Faroe Islands and Vanuatu, to persuade the locals to share their heritage of food. He takes us behind the scenes. You get a glimpse into some of the remotest communities in the world from the comfort of your armchair.A� These are places that you would not normally gain access to, as a normal tourist. So ita��s a real hands-on experience minus any kind of set-up. There are no dress rehearsals or anything, ita��s me just going in there and getting on with it. I firmly believe that food can have healing powers. On the highlight of the filming? Each episode will have something amazinga��the fact that there are still people today that eat things made from scratch, use native ingredients and cook in a certain way.A�I was challenged in each episode in very different ways, as a person and as a chef. As a chef, what did you take away from the show? I got to learn new techniques. Every single country I went to has its own style of cooking and preparations.A� And as a chef, you just have to keep learning every single day. Plus, it was fascinating to see traditional techniques and cultural practices throughout the world and in remote communities. An ingredient you discovered and now love to use. Ethiopia is one place that blew me away. They use a spice mix called berbere which Ia��d never tasted before. I brought it back for the staff to taste and it is something we use for staff meals now. Something you tasted for the first and last time. When I was in Ethiopia, I got to know they eat raw cowa��s stomach as traditional food for Christmas Day. This was not at all appetising but it would have been very rude of me to not partake in the celebration, so I ate it. I wouldna��t eat it ever again though. Premieres December 6, weekends at 7 pm on TLC.